While the traditional television audience for the Super Bowl once again declined, the streaming audience continued to grow strongly. 2 million watched NBC streams and 2 million more watched through vMVPDs. Just as we saw with the regular NFL season and playoffs, viewing was down for Super Bowl LII. 103.4 million viewers watched the game, down 7% on 2017. The most viewers ever, 114.44 million, was for the 2015 Seahawks versus New England game. The 2018 audience was down 10% from those heady heights. 2018 saw the smallest traditional television audience for the game since 2009. I was traveling on Sunday and watched the first half of the game in a bar switching my attention between a TV screen tuned to a cable feed of the game and my smartphone running Yahoo sports. I was using my T-Mobile data plan to watch the game, not the bar’s Wi-Fi. I was unable to watch using any of the vMVPDs because streaming of the game was disabled to mobile devices in those services. The Yahoo stream was behind the TV feed for the whole of the first half. I restarted the stream several times and saw delays varying from 20 to 50 seconds. I never say the mobile feed stall, pixelate, or stutter. The ad load in the Yahoo feed was frequently different than the TV feed. As well, some ad pods were just blank. Other streaming viewers noted this issue as well, many angry at missing out on seeing the same ads as on regular TV. For the second half, I switched locations and used my laptop on Wi-Fi plugged into a 27-inch monitor. Once again, Yahoo Sports streaming quality was excellent. All-in-all, except for the delay behind the live feed, my experience was at or better than traditional TV quality. I will happily watch the game this way again. According to cordcutternews.com, Sling TV, DirecTV Now, FuboTV, and YouTube TV all provided a solid experience with no reported outages or problems. For fuboTV, this was a remarkable achievement. The sports-oriented vMVPD announced it had just crossed the 100,000-subscriber mark in October 2017. It saw 150,000 total viewers for the game on Sunday and 60,000 concurrent average minute viewers. Hulu Live also performed well for almost all the game. Unfortunately, a problem with the company’s automatic program extension algorithm (the game ran over, as usual) caused some customers to lose the feed with three minutes of the game remaining. PS Vue had problems at the start of the game. Some subscribers saw intermittent stream disruption. Sony was able to address the issue quickly and delivered solid performance for the rest of the game. To be sure, any outage of a subscribed service is unacceptable, particularly during a big event such as the Super Bowl. However, TV coverage was not perfect either. There was a brief outage of the NBC coverage on television during the first half. NBC reported that the online audience for its live stream peaked at 3.1 million concurrent viewers, and the average minute audience was 2.02 million. 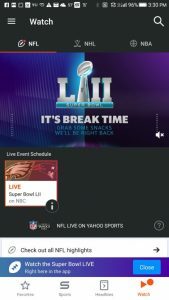 NBC’s live stream was carried by the NBC Sports app, NBCSports.com, authenticated TV Everywhere NBC.com, the En Vivo app, NFL.com, NFL Mobile from Verizon, the Yahoo Sports app and Verizon’s go90. One glaring omission from the streaming figures was the vMVPDs like DirecTV Now and Sling TV. Their numbers were lumped in with the regular TV viewing figures. So, how many people watched the game through these services? There are roughly 4.6 million vMVPD subscribers among all the providers. Sling TV and DirecTV lead with 2 million and 1 million respectively. PS Vue has an estimated 670,000 subscribers. Hulu Live and YouTube TV have 450,000 and 300,000. fuboTV has 150,000 subscribers. The television coverage received a 43.1 rating. However, vMVPDs may be lower than that. PS Vue and Hulu Live both encountered problems, and none could provide the stream to a mobile device. Taking all that into account, somewhere around 1.6 to 2 million likely watched through a vMVPD. That makes the total number of Super Bowl streamers close to 4 million. The Super Bowl provides an annual test of the progress online live streaming is making. Most companies providing a live stream of the game maintained solid television quality or better throughout. nScreenMedia estimates at least 4 million people watched most, if not all, of the game on a streaming platform.